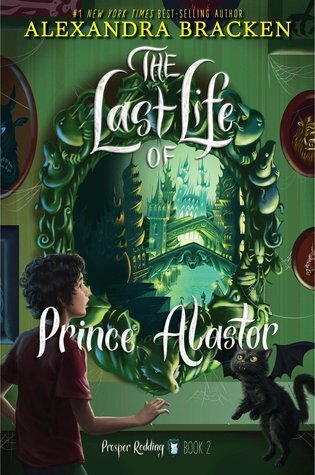 I requested an eARC of The Last Life of Prince Alastor by Alexandra Bracken a very long time ago. It was actually one of the first books I ever requested on NetGalley, and it was a huge surprise to me when I actually got it. In case you missed it, I did a full review of the first book in this series The Dreadful Tale of Prosper Redding. I loved that book, so I was really excited to get back to these characters, especially Alastor. If you haven’t already read book 1 of this series, there may be spoilers ahead, so proceed with caution! As Alastor would probably say, abandon all hope ye who enter here…maggots! The book takes place largely in Alastor’s realm, which was a big departure from the previous book. I did find myself missing Salem quite a bit. Part of the first book’s charm for me was seeing Alastor trying to acclimate to the human world, and recognizing the landmarks of Salem described throughout the story. Though Salem is gone, Alastor still has a lot of adjusting to do. In Prince Alastor, his struggle is more with the emotional and logical side of humanity than the physical side. Alastor himself takes the focus a lot more in this instalment, in general. Though Prosper is still decidedly the main character, I was really happy to see more of Alastor’s inner thoughts and reactions. A lot has changed around his home since he went away to the mortal world, and the adjustment is not an easy one for him. Just like in book 1, there are some BIG themes in Prince Alastor. One of the major ones is forgiveness. Prosper and his friend Nell have some drama to deal with. Watching them reconcile their differences is great. Their plotline really speaks to the importance of communicating and just discussing interpersonal problems instead of ignoring them. Even when faced with a whole host of new creatures and terrifying dangers, the mortals in this story really shine. They bring a level of logic and wit that even Alastor is surprised by at times. I loved seeing them work together, and you can really feel how much Prosper and Nell care for each other. If you loved book 1, I would definitely encourage you to continue the series! Though there are some big differences between them, the second book wraps up the story very well. I love that the book continued to have lots of thematic meat, and I see myself revisiting Alastor and co. again in the future. Have you read this series yet? If you love cute snarky fox demons, give it a try! I recently bought the ebook of book 1! I’m kinda excited to read it, but I’m still doubting a bit haha. I loved her The darkest minds series, but hated her passenger duology… So I guess I just have to try and see where this one will fall!